Jim Elliott is a notable figure in the sustainability movement in Regina and Saskatchewan. He is involved with many environmental action groups, poverty-reduction groups, and the Citizen’s Public Transit Coalition for Regina. He has also attended two of the World Urban Forums. 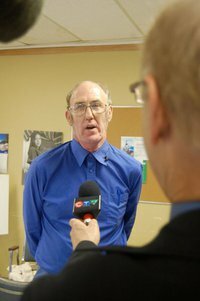 We consider Mr. Elliott to be an icon of sustainable living in the Regina area. As far as we know, he is the only candidate for Mayor of Regina who uses a bicycle as his primary mode of transportation. This is an impressive feat in Regina, where temperatures can range from +35ºC to -50ºC. We are very pleased to present this interview that Mr. Elliott conducted with us. We contacted you for this interview because we know that you have been involved in various forms of community efforts towards sustainability along with related experience in the world of politics. Can you tell us a bit about your background and experience in these areas? First of all, I am always willing to help or volunteer. I have always had good health and have not had to ask for much so I am willing to give back. I have gained a lot of personal experience and knowledge that others, especially the younger or less experienced of them, don’t know where to go or how to do it. I am also a visual learner and may be able to look beyond the tried and true path and do it another way that gets us to where we need to be. As for the practical experience, I have run for City Councilor four times and lately for Mayor of Regina. I got 15% of the vote, so a very respectable first time. So I will be doing it again in 2012. Part of my volunteer experience has been on various city advisory committees for the past 21 years. I have been on recreation boards and community associations for the past 13 years. I am very comfortable with going to meetings. Being on them that long, I can bring past corporate knowledge to the discussion Some people are more interested in doing projects. Much of my volunteer actions have been in the field of environmental actions being involved in Nature Saskatchewan, Nature Regina and the Saskatchewan Eco-Network. More recently, I have been involved in the Health Caucus of the Canadian Environmental Network. These are groups that link human health and the protection of the environment, one might say a no brainer, but a value nonetheless as more people are concerned about ballooning health care bills. This caucus work has allowed me to enter a different sphere of action, that being the United Nations. In 2006, I was part of an environmental roundtable at the 3rd World Urban Forum in Vancouver. Following that, I was part of a delegation to Nanjing, China where we put on a workshop at the 4th World Urban Forum. Here we are interacting with people and groups across the world. I had intentions but due to funding, I was not able to go to the 5th World Urban Forum in Rio de Janeiro where our workshops had people from 22 countries attending. The view to working towards sustainability, again, has been a natural path. My science background gave me an understanding of ecosystems and their self-regulation. I got interested in the Gaia Hypothesis of Dr. James Lovelock who put forward that theory. I am also an active citizen in my community and my neighbourhood. I have also tried to entrench that sense of connection in the operations of my home and my city by looking at sustainable transportation, sustainable landscaping and conservation of water and energy. I have initiated rainwater harvesting at my home. I have been tracking my carbon footprint for the past few years. I have only a bicycle for transportation. I don’t water my yard other than the wonderful rain in the summer. I was an early adopter of the compact fluorescent bulbs and I also lack a real need for most electronic gadgets. I have however used my computer as my outreach tool but have always kept the energy use low by using Energy Star appliances. Part of this has also allowed me to reduce my need for the cash and the need to consume. I therefore can be discriminatory in my spending and boycott companies like the big box stores. I try as much as I can to support local businesses and buy local, but I do not do this as much as I know I should. I do use the perks of my volunteerism to replace the perceived needs coming from the media. Most recently, my television died and rather than replace it, I have gone without television since February 2010. The fact that I don’t miss it obviously meant that I had not seen it as a real need. I did utilize it sometimes when there were documentaries and news that I wanted to observe. I have replaced this with other news sources, such as radio and internet. What initially sparked your interest in these topics? Coming from a rural childhood, I had the ability to observe life around me, I could see the connections between us and all life. From a supportive home life developed by my parents, I was able to explore and read about all things and observe and analyze. I have also had a propensity for numbers and a mechanical aptitude. This gave me a sense that I could fix things and understand how things work. I also had an easy time with some of my education and with the expectations of my older brother and sister to go to university, I went there easily and continued my education there. My volunteerism came with me, as I started the first Biology Club at the university. As I moved from the university into the workplace , I met people who were very active and aggressive in their need to take action and be willing to step forward with their beliefs. This also was mixed with a self-reliant type of living that I experienced on a couple of farms. Because I was there on my own, I had to deal with everything; growing food, managing the land and still keeping up with my interests beyond the farm. The whole area of sustainability was further brought into focus with the Brundtland Commission. I continued my exploration of the Gaia Hypothesis, which indicated that the planet was working towards sustainability on its own. What do you think is the greatest challenge, or set of challenges, facing our society today? The biggest challenge is working as fast as we can, sidestepping the barriers as much as possible, and getting the most people activated enough to overcome the inertia of the current system and see that they can really make a difference, even if they are the only one changing their lifestyle. The problems are cumulative and global in nature – climate change, ocean biodiversity depletion, food security, peak oil, water scarcity, urbanization and corporate globalization. Why do you think these issues are so important? I think we are on the edge of a significant cliff and if we go down the slope, the predicted problems are significant numbers of environmental refugees, climate disruptions, regional starvation and economic collapse. Most of these would put a significant pressure on the human population. But if only a few of these create cumulative problems or a positive feedback loop on others, then we are in severe danger and our existing emergency preparedness will not solve the local or global problems. As they are also linked together, by working on one or more of them, you are working on many of them. So pick one. How much awareness do you think the general public has of this issue? I think everyone has a snippet of some of these problems and some are more globally known. I think some people are ready for change and would change if given the incentives or the help that they need to get through the transition period. There are a few politicians and decision-makers who are blind to what they are doing. They are barriers to real change and have been brainwashed through repetition for so many years, they believe they are not doing anything other than what they think is best for themselves and their friends. We have never run towards a brick wall as we might be doing today. For those in a great majority of the world, they have very little tolerance for failure because they will perish. But in some sense, they have less distance to fall because they have so little to begin with. What work are you involved with that is trying to help better our society, and how successful have you been? I volunteer for a number of inner city groups that provide support for children and the people who have little. I am also part of an anti-poverty network working on getting the city and the community aware of affordable housing. The one that I have felt the best about is a citizens’ public transit coalition. Here we have been able to get a discounted bus pass for low income people. We have also been able to influence city direction to make the system more efficient, more effective, and expand service. Throughout all of this, I have always been a spokesperson (or a thorn) in the side of city council and politicians by talking about the problems they are creating through unsustainable action and by bringing a multitude of best practices from across the globe to bear on the problems in my home town. What do you think is the best way for an interested member of the general public to help bring about positive change in our society? To be a spokesperson for positive change in society, one needs to be passionate and one needs to be informed. There are a lot of people out there who have explored this who can bring the information you will need for the future. One needs to question authority and the status quo. Be an active voter and question your representatives. You will be the change that you want people to take. If you can be the pioneer, there will be others that will follow. You may be alone for a while, but time will show that you have taken the right path. Most change has started with one person walking on a different path. Thank you very much Jim for your insights and your dedication to bettering the lives of those around you! I'm an aspiring omnologist who is fascinated by humanity's potential. Please donate if you find our work useful. Your support helps us to continue to contribute to society through our work.